Growing up as an only child with a peanut allergy and a concerned mother, Marc-Olivier Deguise spent a fair amount of time in doctors' offices. However, he soon realized that he was one of the lucky kids in the waiting room � his condition was easy to manage. "At that time, I knew that when I grew up I wanted to do something that would help children," he said. 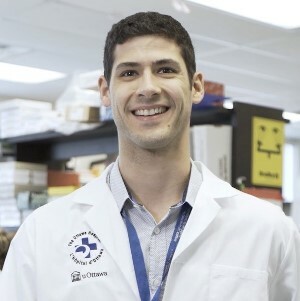 This desire to help children led him to join Dr. Rashmi Kothary's lab at The Ottawa Hospital during the fourth year of his bachelor of science at the University of Ottawa. Under Dr. Kothary's supervision, he studied a genetic muscle-wasting disease that affects mainly young children, called spinal muscular atrophy, or SMA. Now, five years later, Deguise has helped make a major discovery that has shaken up what is known about this disease. It was thought that SMA affected only the nerves controlling the muscles, but Deguise's discovery suggests that it also impacts the immune system. "It was a big surprise," said Deguise. "It started with one observation, and now it's a big research project." Their results were published in the journal Human Molecular Genetics. Around the same time, two separate groups found similar results in other mouse models of SMA, which supported their findings. "The research fairy brought us some luck," said Deguise. "Dr. Kothary has always believed that SMA affects multiple organs. Our finding that SMA may not just be a muscle nerve disease is now slowly changing the landscape of our field. It is nice to see that more and more researchers are accepting this idea." Deguise's next step is to study the immune defects in human patients with SMA. He also wants to learn whether these defects actually keep the immune system from doing its job, or worsen the symptoms of SMA. "If I can contribute to reducing the time SMA patients spend in hospitals, improving their quality of life or even helping develop new therapies through my research, that would be really rewarding," he said. "In medicine you get to help people at a local level," he said. "But if you do research and you find good things that can help, then you can help even more people at a global level."